This L’Ormarins 1984 Cabernet Sauvignon Estate wine was made and bottled by Bergkelder, Stellenboch. It is, however Wine of Origin Franschoek, with alc. 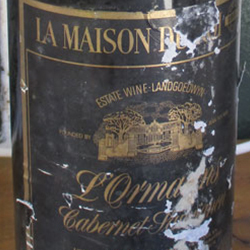 12% volume and carried the Description of LA MAISON DU ROI so named after the founder of The Estate in 1694, Jean Roi. It was once part of a collection selected for The Bucher Family. Enter your email below to get notifications of new bids placed on the above item.